Since Donald Trump declared war on the New York Times, circulation, subscriptions and online readership have increased massively. Opinions are shaped in these halls every day. For many Americans, The New York Times is the last bastion of truth. The New York Times tower in Midtown Manhattan on 8th Avenue, designed by Renzo Piano, is the fifth-highest building in New York. It houses the world’s most prestigious daily newspaper, which has been locked in a private battle with the sitting President of the United States, Donald Trump, ever since the latter took office. Trump calls the Times ‘failing’, claiming the newspaper is losing its readership in droves due to the fake news it circulates about him. Higher than Trump Tower. In fact, the opposite is true: after the US election, the New York Times’ online readership has climbed to unprecedented heights, and the paper closed tens of thousands of new subscriptions both for its digital as well as print editions. This imbues the 52 story New York Times Tower with symbolism: the building is higher than Trump Tower on 5th Avenue by as much as 117 meters. And since Trump’s world revolves around scale and appearances, this must sting. A beacon of hope. In the New York Times editorial conference, Editor in Chief Dean Baquet and his team discuss big issues the whole world talks about. Some of the topics about to be shaped into news stories are yet to break when America’s most important daily newspaper leaves print the following morning. Baquet has held his position for the last four years, but it was the inauguration of Donald Trump as US president that made Baquet a beacon of hope, a living symbol of free, independent journalism. Just recently, Baquet has received the “Freedom of Press Award”. “Dean not only embodies the best of journalism, but he inspires it in those around him,” said Bruce Brown, executive director of the Reporters Committee. Baquet has worked as journalist for four decades, starting with a stint at Times-Picayune, a New Orleans based daily newspaper. Positions at the Chicago Tribune, New York Times and Los Angeles Times followed. Digital Powerhouse. Under Baquet’s leadership, the New York Times ascended to the rank of the world’s most important newspaper. The Pulitzer-Prize winner transformed the media battleship from a traditional print format into a digital powerhouse. And he did it all without sacrificing the quality of journalism. The New York Time is frequently ahead of the pack with its stories and reports. It uncovered the influence of Russia on the presidential elections and broke the story of Harvey Weinstein’s sexual assaults of dozens of actresses. Fake News. With his coverage of White House politics, Baquet made an enemy in the president. At his inaugural speech, Donald Trump he will “fight fake news” – an announcement directed at the New York Times. According to Trump, the Times is an “enemy of the people”. Trump had already started attacking the media house during his electoral campaign, predicting that the paper will be bankrupt within three years. The reality is quite different. Whenever Trump hurls an attack at the New York Times, print sales soar and online readership skyrockets. OOOM in the editorial conference. The glass palace on 8th Avenue houses the world’s largest newspaper editing team, almost 1250 strong. The atmosphere during the editorial conference is casual and composed. 45 journalists, heads of department, photo and story editors and reporters sit on light-green office chairs arranged around a brown conference table, an outsized square in the middle of the room. Indirect light illuminates the windowless room. Some participants have laptops in front of them, but the majority scribbles their notes into pads. The Washington office is linked in via phone, Elisabeth Burmiller, bureau chief in the capital, shares her latest research about Trump. One subject after the other is worked off the list in a professional manner, every department head gets the word, introducing their story for the following day. In a reaction to Trump’s attacks, the newspaper built an investigative pool in Washington, investing five million dollars into the Project. 45 OF THE BEST JOURNALISTS IN THE WORLD MEET ON ONE TABLE FOR THE EDITORIAL MEETING. TO DATE, NEW YORK TIMES JOURNALISTS HAVE WON 177 PULITZER-PRIZES FOR THEIR STORIES AND REPORTS. The Fourth Estate. Just recently, the feature length documentary “The Fourth Estate” had it’s premiere at the Tribeca Film Festival, granting deep insights into the reporting of the New York Times over the course of the first year of Trump’s presidency. It is the first installment of a four-part series aired by US cable channel Showtime. Robert Redford showered praise on the documentary. In other news, the New York Times has just received a Pulitzer Prize for its investigations on Harvey Weinstein, which would spark the #metoo movement. The award marks the 117th Pulitzer Prize for the newspaper since its foundation in 1851, making it the highest-awarded newsroom of the world. 300.000 dollars for a fish. The afternoon conference, which begins at 4:30 pm with the participation of the OOOM team, lasts for just short of 40 minutes, after which all participants know exactly what to do. The photo editors make a brief presentation of the images and pictures for the next print edition. That day, all political issues, all escapades of Donald Trump are overshadowed by an entirely different news story, capturing the interest of this illustrious round of journalists, who are probably the best in America. The story revolves around the most expensive aquarium fish in the world. The Arowana, a South American sweet-water predator-fish grows to a size of 1.20 meters and is worshipped in China, where it is called “dragon fish”. Its appearance is rather unassuming, somewhat like an over-sized goldfish, but it is held in such esteem by its owners that the latter at times subject their fish to cosmetic surgery like eye-lifting. Singapore based doctor Eugene Ng, known to his clients as “Dr. Ark” after his beauty salon of the same name, is one of the authorities for procedures of this kind. The most expensive dragon fish of the world was purportedly sold to a Chinese aficionado for 300.000 US dollars – a price point which is by no means unusual, as we are assured. Even among the journalists of the New York Time, who have seen their fair share of spleens and shamelessness, this raises eyebrows. The Arowana will go on to grace the cover of the next day’s issue. Baquet welcomes OOOM. At the end of the editorial meeting, Dean Baquet welcomes his Austrian colleagues from OOOM in front of the assembled team of journalists. He leafs through our magazine, and our story about the Dalai Lama catches his eye. “Very well made”, he comments on our issue. And then the next scheduled meeting awaits. We are led into a meeting room with glass walls, located on the same floor. 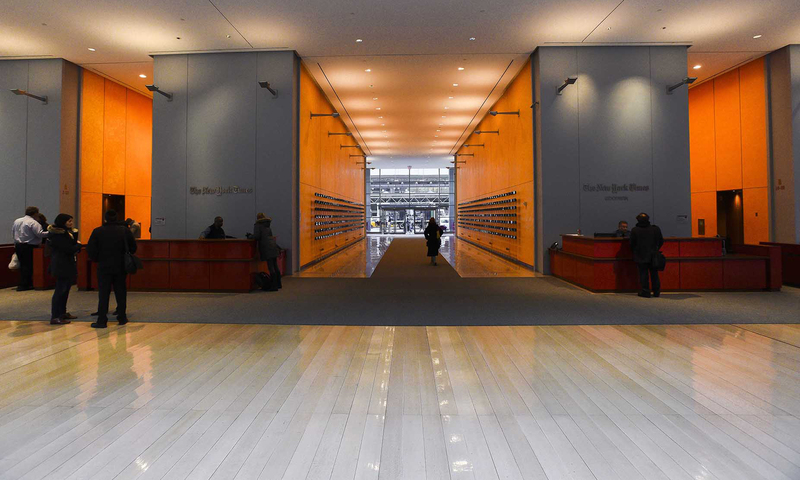 The glass walls give a sense of the dimensions of the editorial offices, convey a feeling of how many people are involved in the production of the New York Times every single day. On Sundays, the paper still shifts more than a million copies, the circulation on weekdays is more than half that number. The New York Times‘ offices take up 27 floors of the tower, the remaining space is rented out. The high-tech newsroom e spreads out over three floors. More than 30 print outlets and a wide range of online media are produced in the tower. A global news organization. Jodi Rudoren enters the room, a cup of coffee in her hand, welcoming us. Working as part of the editorial team since 1998, Rudoren is a New York Times veteran. As editorial director of New York Times Global, she is responsible for widening the paper’s worldwide reach, and in charge of expanding the Times’ standing as global news organization. In her role as associate managing director, Rudoren is also heavily involved in shaping the daily print product.